The INLD has been stung by desertions following a vertical split and suffered a heavy by-poll defeat when it failed to hold on to Jind seat. Opposition Indian National Lok Dal’s state unit president Ashok Arora has said he will fight the Lok Sabha polls if his party asks him. Arora, a senior leader of the party, had unsuccessfully contested the 2014 Haryana state assembly polls from Thanesar constituency in Kurukshetra district. He said the INLD will fight on all 10 Lok Sabha seats from the state. “Our party will fight on all 10 seats,” he said and added the names of the candidates will be announced soon. “After taking feedback from the people and in consultation with them and our party workers, we have prepared a panel, which has been sent to party’s national president Om Prakash Chautala. “Soon, we will be meeting and consulting our party chief after which the names of candidates will be announced by April 16,” Arora told reporters in Kurukshetra on Thursday. The 10 Lok Sabha seats of Haryana will go to polls in a single phase on May 12. Two of party’s sitting MLAs Ranbir Gangwa and Kehar Singh joined the BJP recently. A few of the party’s former legislators have also switched over to the saffron outfit ahead of the Lok Sabha polls. 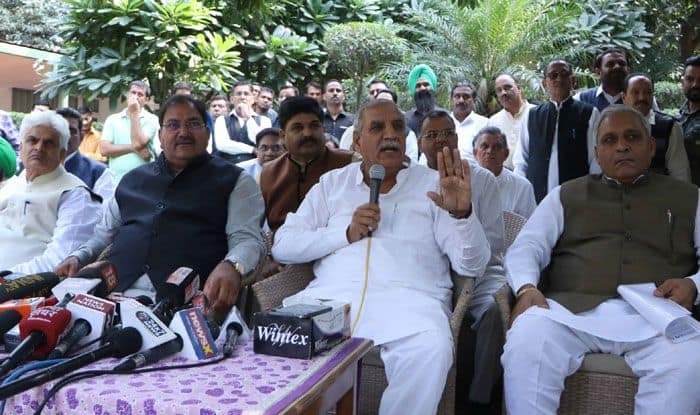 Four INLD MLAs have already switched sides and announced their support to the fledgeling Jannayak Janata Party (JJP), which was formed after the split in the INLD last year. Hisar MP Dushyant Chautala — elder son of Abhay Chautala’s brother Ajay Chautala — launched the JJP last year. The INLD, founded by late deputy prime minister Devi Lal and headed by former chief minister Om Prakash Chautala, has been out of power in Haryana for over 14 years now. Arora hit out at the Manohar Lal Khattar government, saying it failed to fulfil the promises made at the time of state assembly polls in 2014. “The plight of farmers is known to all,” he added. Meanwhile, JJP state unit chief Nishan Singh told reporters in Fatehabad on Thursday that “while the BJP claims that it has given transparent and clean administration, truth is that corruption is rampant everywhere”. “Nothing has changed, they are only making hollow claims on having checked corruption,” he said.